I finished my orders yesterday, and here are two of them,the top card is being posted, so had to stay quite flat. I used Stampin Up botanical blooms dies and stampin up cardstock for this one, and die cut some glitter flourishes, punched a glitter butterfly, and added liquid pearls and sequins. 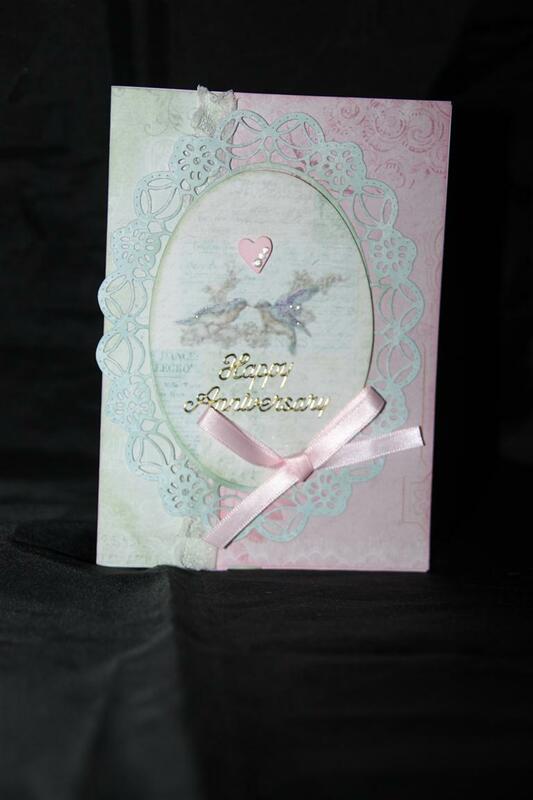 the bottom card was much more textured with lots of flowers,more glitter flourishes, and key and ribbon bow. I am caught up with my orders now, but no crafting today, I am taking Mum out to spend her Mothers day money at Paper Flourish and we will visit spotlight too – we are on the hunt for very very fine paint brushes for dad, I found them on-line but they are very expensive and he goes through so many so we will have a look around locally.Til tomorrow…. 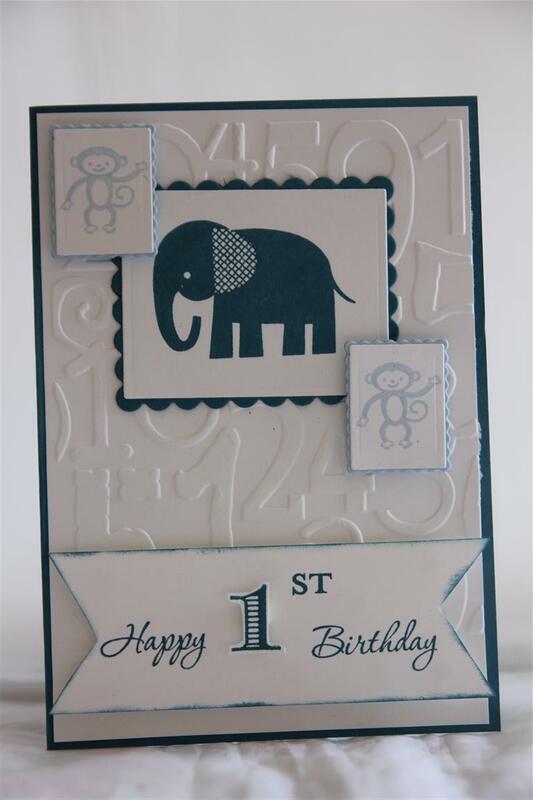 the next few cards are ones I made with one stamp set from Stampin Up – Zoo Babies.the embossing folder I used here is a cuttlebug folder,and I used spellbinders scalloped rectangles dies, and everything else is from Stampin Up . Inks used were soft sky and midnight muse, as was the cardstock ( along with whisper white). I hand cut a banner and the stamps used on the banner were from the stampin up memorable moments set. Another hot day here but have managed to make a few cards – I have an order to fulfil otherwise I would be sitting under the air conditioner duct! Til tomorrow…. Christmas using non xmas items! So after I made yesterdays card, I looked around the craft room to see what else I had that could be adapted to Christmas cards, and found my spellbinders Lacey pennant dies. When turned upside down they looked like christmas trees to me, and this is what I came up with – I have a couple more which I will show over the next couple of days. 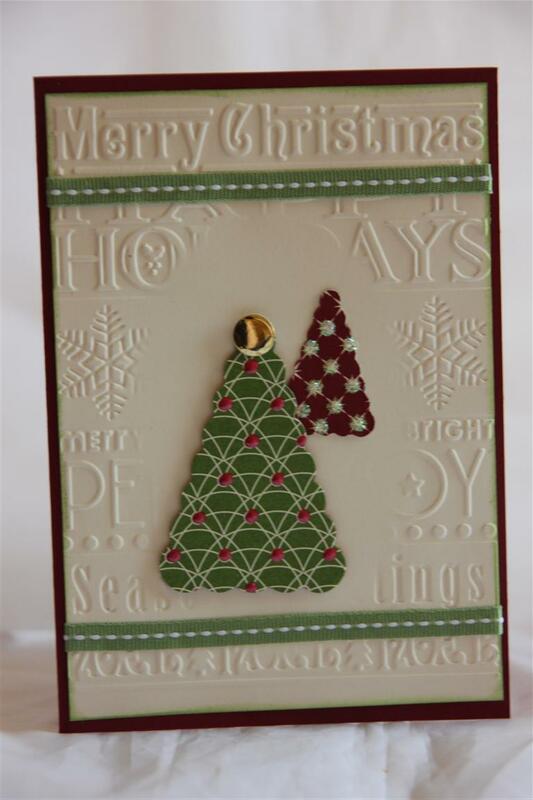 The cardstock is Stampin Up Cherry Cobbler, and the embossing folder is a cuttlebug brand. I used my Tim Holtz embossing diffuser ( number 1) to keep the centre clear of embossing, and die cut the pennants from Stampin Up Be Of Good Cheer designer paper. The ribbon is also Stampin Up Wild Wasabi.I used a few dots of perfect pearls Rouge on the tree at the forefront.Til tomorrow…. This is a weddding anniversary card that I made for my market box. I used my new Cheery Lyn Polynesian Sails Oval die, which I like, but found I had to use my metal plate with it to get the delicate cuts, although that could be my cuttlebug, as it is the first major item I bought when I started cardmaking, and I use it on almost every card I make and I think the rollers are a bit loose. The papers I used here are from Melissa Francis C’est La Vie range and I just added a little ribbon and lace. I bent over yesterday, and my back decided that it liked that position and I couldn’t straighten up so I have been in a fair bit of pain, and no cardmaking has been happening. I have given myself a stern talking to, and it is a little better so I might be able to sit in the card room tonight.. Til tomorrow…. 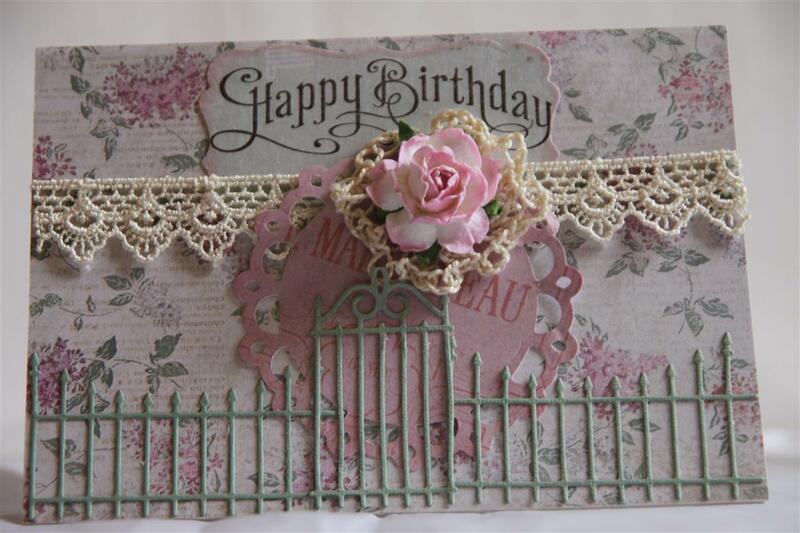 I saw these two dies – memory box rounded fence and wrought iron gate, and couldn’t resist them! I have teamed them with a couple of spellbinders dies – Picot edge cirle and a label die, and a Stampin Up sentiment stamp from the perfectly penned set. I just added some lace, one of my hand crocheted doilies, and a bought flower although next time I will make my own! The paper is from a 6″ paper pad by melissa francis called Cest La vie. I sponged all the edges with Tim Holtz spun Sugar ink. No cardmaking tonight as its shopping night – Til tomorrow…. 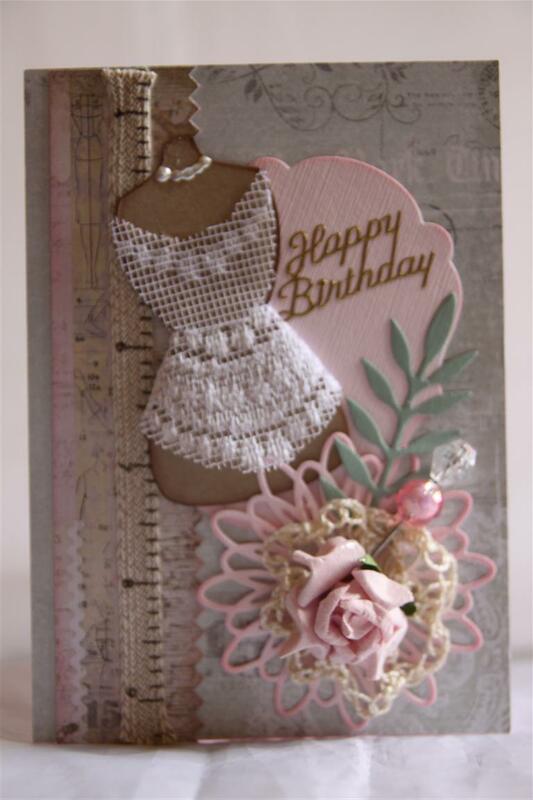 IThe vintage style is a favourite of mine and here I have combined it with my new spellbinders dress form die. The paper is Melissa Francis C’est La Vie and I also used my cuttlebug to cut a spellbinders labels 14 die, and memory box dies – Amana circle and meadow leaf. I crocheted the doily ( I am no crocheter so don’t look too closely!) and I added a flower and beaded hat pin to finish.I covered the dress form with a little curtain remnant, and added some liquid pearls for a necklace.I am hoping to spend a little time in the craft room tonight, it has been a busy weekend with not much crafting done, so the ideas are backing up!Til tomorrow….